We will actively engage with and learn from stakeholders, drawing on their experiental evidence regarding what works to ensure an equitable improvement of newborn and maternal health. Through ongoing engagement activities, we also seek to increase the awareness among those in power of the problem of large inequalities in maternal and newborn mortality and how best to address this problem. A summary of the stakeholder engagement activities is given below. Please click here for an overview of the website announcements and the resources produced for the study annoucements. to build a platform for ongoing engagement. 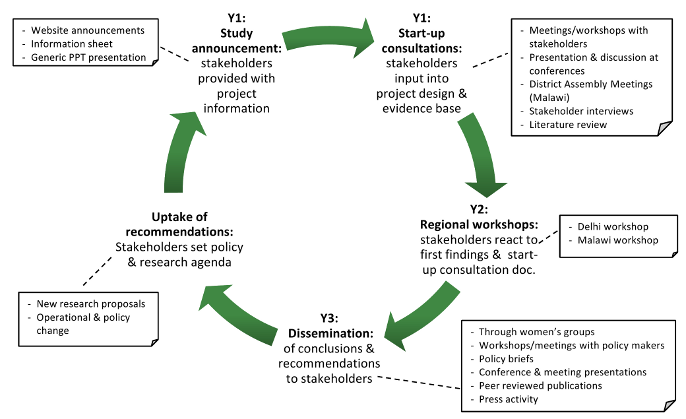 In particular, we aim to draw on experiential, often tacit, evidence of stakeholders regarding what works and what doens’t work, in which contexts, to achieve an equitable improvement in newborn and maternal health. This workshop brought together policy makers, practitioners and researchers from the South Asian region to share and discuss the latest evidence on how to address inequalities in newborn and maternal health. Experiential evidence from policy makers and practitioners on what works to address inequalities. The workshop output included recommendations for country action plans to address inequalities in the Every Newborn Action Plan (see publication in Lancet Global Health). For further details, see the workshop flyer, the workshop participant list, and participant group photo. We plan to hold a regional in Malawi later this year. The purpose is to present and discuss initial findings and ask for input from a broad audience from several countries in Central Africa and South Asia. We will hold targetted dissemination presentations at national level seminars in Nepal, India and Bangladesh and at the community level through women’s group meetings.